Discussion in 'Aerostar Forum' started by Godleydemon, July 29, 2012. I bought a trailer hitch installation for my van today as I"m going on a long trip to Ohio from Oregon starting on the 2nd of August. I needed the trailer hitch to pull a 5x8 enclosed trailer filled to the brim with tons of stuff. My problem is after assembling the darndable thing (there was a bolt missing and I had to go buy one -.-) then getting it jacked up into place. I can't see how I'm supposed to get the bolts in. My instructions tell me to use this thing piece of wire to maneuver the bolts into place. But I can't get the bolts in the frame because theres no access point for them. I was trying to take off the bumper earlier today to see if there was an access point but figured there has to be an easier way then taking the entire bumper assembly off. Any help is appreciated on this. Welcome to this forum! There are only a few bolts connecting the bumper to the van. Try not to apply pressure in the corners since the corner slide pieces are fragile. Well I have removed the two bolts on either side at the bottom of the bumper. But it seems as though something else is holding it in place. I have started to try and remove the outer parts of the bumper on the side of the van. But those too seem like there being held in place by something I cannot see. There are more than two bolts connecting the bumper. Check the top area above the bottom bolts. Well I mean I removed 4 bolts in total, two on both sides. Sorry for my wording there, I can understand how it could be misunderstood, lol. I'm working on the bumper right now and trying to see if I can get her off of there. The first image was uploaded to the site's photo gallery, but came out small. The attached image is a little larger. so I tried removing it again and it won't budge. I believe I found two bolts though hidden in the frame with two access holes just big enough for a ratchet that I will begin to remove next. Do you have the regular size body or the extended body which is 15.4" longer? so with the bumper off I realized the access hole to the frame is WAY to small to get the bolts in with the brace that the hitch requires. So I've cleaned up and given up for tonight. I'll start on it again tomorrow here. Any ideas on the access to the frame? I'm attaching an image to show what I'm talking about. Why can't you drill holes to attach nuts, washers, and bolts? 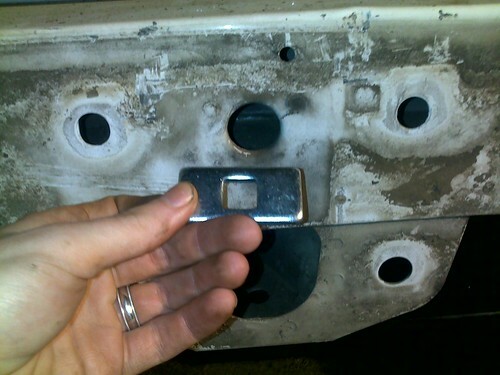 I had the same problem and drilled a couple of clearance holes for the plate to pass through. Had to file a little bit but worked. I can't remember exactly but I selected a drill bit that was bigger than the thickness of the plate. Think of a slot needing to be cut into the metal. It just so happens that there is a big hole there already. Use a 3/8 or larger drill bit and drill at opposite ends of the large hole. Make sure and start drilling far enough to the outside of the hold so that the drill doesn't walk over. Do the same on the opposite end of the of the big hole. You may need to file a little bit or maybe you can walk the bit over to create the slot. I tried to attach a simple drawing but don't know how to do that. Hope this gives you the correct mental picture. I seem to remember that you need to fish this bolt and plate down the box channel. A guy at a UHAUL showed me a slick way of doing this with no cuss words involved. You need a piece of wire ling enough to go from one hole to the next. This guy used a Delta washerless faucet spring soldered to the end of the wire. The bolt threaded right into the spring, snaked the bolt and plate through the hole/slot and dragged the bolt right into place and through the hole. I've mounted a few hitches to my aerostars and this may or may not be what you are trying to accomplish. Good luck!